Built in the early 1800s for Timothy Tredwell and later owned by Valentine and Abigail Hicks, members of the very prominent Quaker family. During the pre civil war years, this house was possibly a part of the 'Underground Railroad' and had a secret attic room that may have hid runaway slaves. Today it operates as the 'Maine Maid Inn', a restaurant. Click HERE to see the house on google earth. Update: The Maine Maid Inn has since closed. I am so glad to see this! My mother and her family used to go to the Maine Maid in for a treat back in the 30s and 40s but I had never seen a photo of it - glad it is still around! Furthermore, we're kin to Valentine and Abigail - my grandmother was a Hicks. Her (non-Quaker) Hicks grandfather told about visiting his Quaker relatives at Lake Success, perhaps he was referring to V and A's children? This house was actually built in the early 1800s by Timothy Tredwell who lived in it until his death. It was purchased by Valentine Hicks in 1814 who moved here from New York city with his wife Abigail Hicks and their daughters. Valentine Hicks was a postmaster in Jericho from 1826 to 1839. The Jericho Post Office was probably in the front parlor during those years. Hicks was the 2nd president of the LI railroad and was instrumental in getting the train out this far - that is why Hicksville is named for him. The house was owned by many others after Valentine Hicks. It may have been a stopover on the Underground railroad for runaway slaves. Subsequent owners included an Underhill, Seamans, a Phipps, Boyces, and Bayers. Percy L. Roberts bought the house from the widow Bayer, in 1950 to make it into his Maine Maid Inn that had been previously located across the turnpike in the (house) building that he had leased for ten years, but was not for sale. Not long after he moved his restaurant into the Valentine Hicks house the former site was made into the Mille Ridge Inn. For more information see my book, "Jericho, the History of a Long Island Hamlet" available for a $20 donation to the Jericho Public Library. 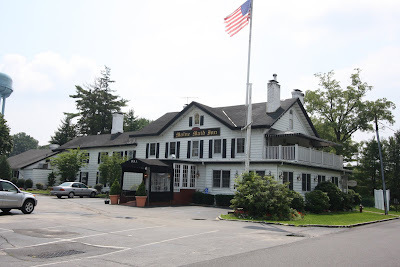 On July 27, 2011, the Oyster Bay Landmark Commission issued an approval to proceed with the local landmark application process following a meeting attended by over 100 people. Presentations were made, comments were heard and packages of materials were presented to Commission members. NO objections were presented. The hearing will be scheduled within the next 30 days.